Milnes visits a trap for brown marmorated stink bugs at the Yakima Area Arboretum. It's part of a WSU project monitoring the life cycle and changes in the invading insect's population. WSU Photo by Matt Ziegler. WENATCHEE, Wash. – His Toyota Prius loaded with tiny wasps, Josh Milnes is about to make life very difficult for an invasive stink bug threatening Washington fruit growers. 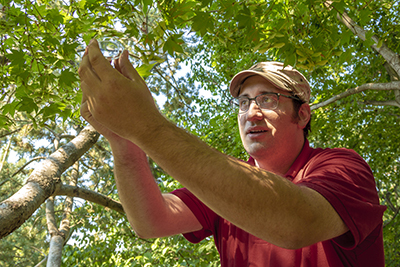 “The brown marmorated stink bug isn’t supposed to be in Washington,” explains Milnes, entomology graduate student at the WSU Tree Fruit Research and Extension Center in Wenatchee. Native to eastern Asia, the brown marmorated stink bug (BMSB) arrived in the 1990s in the United States. In 2004 it was discovered in Portland, Oregon, and quickly spread to nearby Clark County in Washington. Five years later the bug was found in 21 Washington counties. A prolific feeder, BMSB dines on more than 300 plants, including apples, peaches, cherries, berries, row crops and cereals. It’s an urban pest, too, overwintering in people’s houses — and sometimes coming inside by the tens of thousands. BMSB costs U.S. farmers millions annually in damaged crops, and poses a danger to Washington’s $2.4 billion apple industry. Equipped with a sharp, straw-like snout called a proboscis, the stinkbugs pierce the apple’s skin and spit digestive juices into the apple, leaving a small, brown, mushy wound. Most of the apple remains perfectly fine, but it’s damaged goods. Parasitizing a mass of brown marmorated stink bug eggs, the Samurari wasp “is BMSB’s natural enemy,” says Milnes. WSU Photo by Matt Ziegler. Thanks to its long proboscis, BMSB is safe from most targeted, sprayed pesticides. “You have to use a broad-spectrum pesticide to deal with it,” said Milnes. “But that wreaks havoc with Washington’s long-established integrated pest management systems” — holistic approaches that rely on beneficial insects, habitat changes and other sustainable techniques to manage pests. Funded by grants from the USDA and the Washington Tree Fruit Research Commission, Milnes and his advisor, WSU Entomology Professor Elizabeth Beers, are developing biological controls for BMSB. Scientists elsewhere had already discovered one such living weapon — a tiny wasp, Trissolcus japonicus, a.k.a. the Samurai wasp, that preys on the bug in its native Asia. “It’s BMSB’s natural enemy — a little wasp that packs a big punch,” Milnes said. 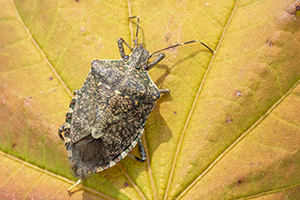 Originally from Asia, brown marmorated stink bugs have spread quickly through the Northwest. WSU Photo by Matt Ziegler. 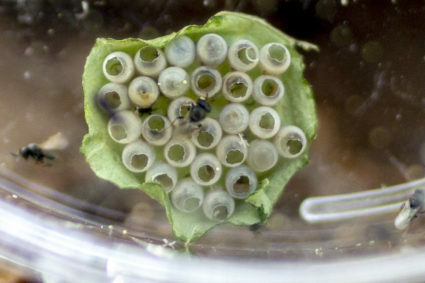 Samurai wasps lay their eggs inside stink bug eggs. The young wasps, called larvae, then devour the developing stink bugs, called nymphs, before they can hatch. A single wasp can eliminate an entire egg cluster, making it a promising, natural pest control. “The Samurai wasp is so effective, it will wipe out 70 to 100 percent of those eggs,” Milnes said. Only about a millimeter long, the Samurai wasp only targets stink bugs, not humans. “They’re so small that if they did try to sting you, you’d never feel anything,” Milnes said. Regulations are strict when it comes to release of an exotic natural enemy. Milnes was able to skip years of process after discovering an already-established population of Samurai wasps attacking stink bugs in a park in Vancouver, Washington, in 2015. Now, he is releasing wasps in Walla Walla, Yakima, Prosser, White Salmon and other urban areas where the bug is already well established. “I’m trying to intercept BMSB before it can get into our fruit industries and cause major damage,” he said. Back at his Prius, Milnes arrives at his destination. He’s found the perfect spot to release about 100 adult Samurai wasps: a stand of crabapple trees in Walla Walla’s 40-acre Pioneer Park, ground zero for that city’s population of invasive stink bugs. Buzzing under petri-dish lids taped atop recycled soup containers, these Samurai wasps have a single goal in mind. A week later, Milnes will return, find some BMSB eggs, and see if his wasps survived. 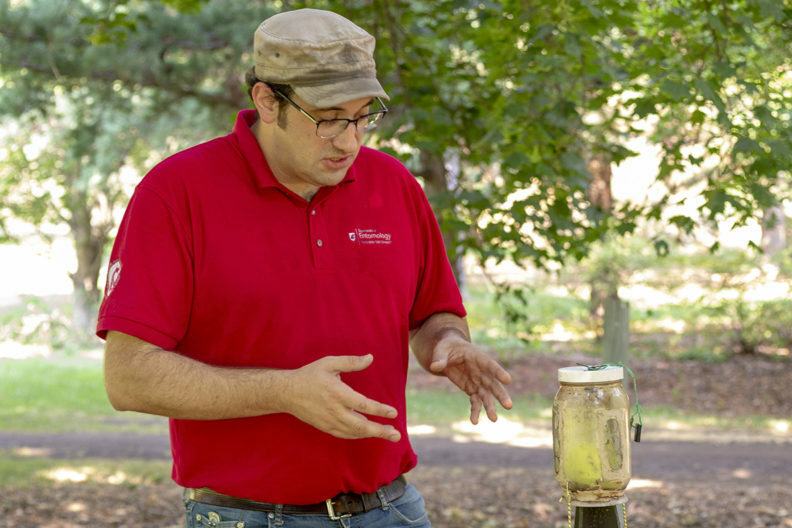 Joshua Milnes, graduate student in entomology at Washington State University, releases Samurai wasps at the Yakima Area Arboretum. The wasps parasitize the invasive brown marmorated stink bug, offering a potential control of this invader. WSU Photo by Matt Ziegler. Milnes is making sure that, once introduced, Samurai wasps won’t prefer to chow down on native stink bugs. “When you introduce a new, exotic species, you run the danger of screwing up your local ecosystem,” he said. That’s why, for the past two years, Milnes has experimented with a menu of sorts for the wasps, offering them a choice between BMSB eggs and native stink bug eggs. So far, they’ve always chosen their longtime host. To determine the best times of year to release the wasps, Milnes is studying the life cycle of the stink bug — how often it reproduces, where it lives, how fast it matures. “My goal is to get brown marmorated stink bug under control,” Milnes added. “Now that it’s spread across Washington, we may never be able to eradicate it. But we can keep it from harming our agriculture and taking over our homes.